Laura has lived in Hillsborough for nearly 20 years. She is originally from Amsterdam and feels she has the best of both worlds, with a daily dose of the beautiful Hillsborough countryside, and a dollop of culture on her home visits. Inspired by leather; its smell, colour and form, Laura began designing and making leather goods. 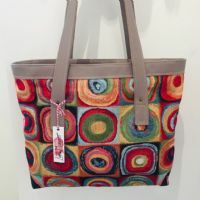 She now has her own unique range of handmade bags, purses and notebooks.